Sure February 16th is close to Valentine's Day and this would be a perfect night out for you and your lovey dovey one, but it also makes a GREAT night out for all you SINGLE and AWESOME groups, too! 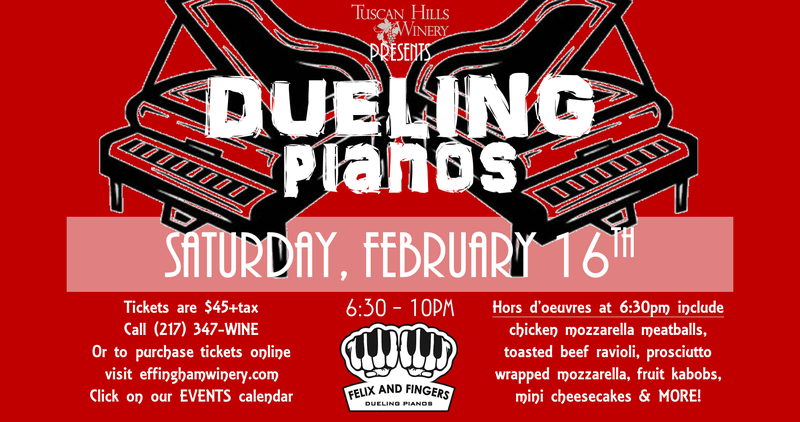 Felix and Fingers is a dueling pianos company that thrives on audience participation. The high-energy all request show will play your favorites, the classics, the slightly inappropriate or the obscure. If you want to dance and sing for Valentine's Day, our dueling pianos can make that happen like you've never seen before. Hors d'oeuvres include chicken mozzerella meatballs, toasted ravioli, prosciutto wrapped mozzarella sticks, fruit kabobs, mini cheesecakes and MORE!